came out in 1933 and started a tradition that made the Sears Wish Book an American icon. inside all of Sears 1988 Spring General Catalogs and at all order desks across America. 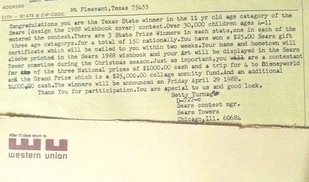 Judging for the contest was in three age groups: four to five; six to eight; and nine to eleven. 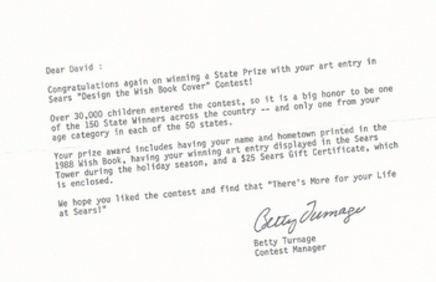 and from them, one design titled "Christmas Wishes" was chosen as the Grand Prize winning design and was displayed on the cover of the 1988 Sears Wish Book. In 1933, Sears was already a familiar part of America’s Christmas tradition. The 1896 Sears general catalog included wax candles for Christmas trees. The 1898 Sears catalog added Christmas cards, and the first Christmas tree ornaments appeared in 1900. 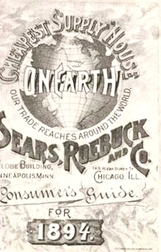 Sears began selling Christmas stockings and artificial Christmas trees in 1910. Electric Christmas tree lights made their debut in the catalog two years later. The 1933 Christmas Book catalog started a tradition that made the Sears Wish Book an American icon. The Sears catalog and the name Wish Book were closely linked over the years. Prior to 1933, Sears customers often affectionately referred to the large, semi-annual, general catalogs Sears issued as the “Wish Book” or “Book of Wishes.” After 1933, the Wish Book name became synonymous with the annual Christmas Book catalog. In 1968, Sears made it official by renaming the Christmas Book Catalog The Wish Book. The 1933 Christmas Book catalog cover illustrated some of the featured items in the catalog. The next year Sears started a tradition by putting colorful, warm Christmas scenes on the cover. 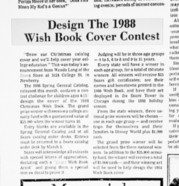 From then on, the Wish Book catalog covers regularly featured children, Santa Claus, and Christmas trees. In 1982, a Currier and Ives print graced the cover of the Wish Book. Many people nostalgically think of the Wish Book as filled with nothing but toys. In fact, over the years, more pages were devoted to gifts for adults. The 87-page 1933 Christmas Book catalog featured 25 pages of toys and 62 pages of gifts for adults. In 1968, the Wish Book totaled 605 pages, with 225 pages devoted to toys and 380 pages to gifts for adults. The Wish Book tradition continued into the twenty-first century with Wishbook.com, first launched in 1998. In 2009, Sears introduced a new, interactive, online version of everyone's favorite Holiday Wish Book, allowing shoppers to easily turn the virtual pages of the catalog and purchase products instantly from their computer.